My first thought on learning that Robert Parker will no longer review California wines was, what's Enologix going to do? Leo McCloskey has made his wine consultancy successful by reverse-engineering Parker's palate; telling wineries how to take the technical steps that will get them a higher Parker score. Maybe Enologix's methods will also work on Parker's replacement, Antonio Galloni. But this has to be a busy week at the company, as they're scouring Galloni's reviews of Italian wines for tips on how to get his 98s. * Parker's not stepping down, yet, and that's good for Bordeaux, which hasn't figured out how to price wine without him. I heard that a knee injury will keep Parker from going to this year's En Primeur tasting, and that will have the whole Bordeaux industry scrambling. But that's a good thing: while Parker will probably hold onto the most influential part of his portfolio as long as he can, depending on his physical condition that might only be another decade or so. * Jay Miller might be a nice guy, but as a wine lover I'm really glad that he didn't get the California portfolio for the Wine Advocate. * Parker's continuing disdain for Burgundy couldn't be more clear. It's the only region in the world that he separates, giving the best parts to his successor Galloni and leaving the Macon for David Schildknecht, whose portfolio has a clear "and the rest" feeling. * Meanwhile, Galloni also gets Champagne and keeps Italy, along with all of California, Chablis and the Cote d'Or. It's crazy. If he's able to keep up with the workload, he will become more powerful than even Parker was. It's hard for me to imagine that one man can be an expert at the Advocate level -- knowing all the new wineries, even the tiny ones -- on all these diverse and distant regions. * But if one man does have to have all that power, aren't you glad he was weaned on Italian wines? It's a good day for acidity. * Does this make Wine Spectator temporarily more powerful? Possibly. It also gives a window of opportunity to the three less-influential raters -- Wine Enthusiast, Wine & Spirits, International Wine Cellar -- to push for new readers. That said, the nakedly competitive way to do it for one of those three might be to try to replicate Parker's scores, as those standards (power most important; acidity a negative) have an established audience. * The main blogger reaction is probably going to be "scores don't matter, Parker was a dinosaur." We'll see. I heard recently that one of the largest retailers of wine on the West Coast refuses to taste any wine that didn't get a 90-point score from one of the five main publications (above). * Moreover, wholesalers love point scores because it simplifies their job. If a new Parker doesn't emerge naturally, wholesalers will take steps to create one. * Good timing for James Suckling, although California has never been his thing. But if you were a certain Hollywood producer with money invested in the longhaired one, wouldn't you be helicoptering your frontman around Napa this week so he could get 96 here, 97 there? * Since this brings Parker's career in California to a close, is it time for him to finally get into the Vintners Hall of Fame? As Chairman of the VHF Electoral College, I'll refrain from too much opinion here. But Parker has twice missed out by a single vote; keep an eye on next year's ballot. * The question everybody wants answered is: Will Galloni make California winemakers pull back from some of the excess they have been rewarded for? There's nobody in wine with more weight on his shoulders today. Welcome to California, Antonio Galloni! Sadly, I don't think anything will change until we free ourselves from the constraints of this system. To be sure, there are positive aspects of a rating system for wines - it (theoretically) helps to segment the marketplace based on quality. Unfortunately, it is used more often as a mechanism of trapping tasters instead of freeing them. Trading one palate for another only changes the landscape on the surface. Even if the new taster has the wine aesthetic of most wine blog readers, it would only act to focus attention on a different style of wine and trap people into a different style-prison. Who is Robert Parker? And for that matter, who is Antonio Galloni? "Italy, Champagne, Chablis, Côte d'Or, California"
This is supposed to facilitate expertise and context-based insights into the wines of any of those regions? It remains to be seen what Galloni will bring to the party. But ratings are not going away, and if the WA becomes less influential over time, then someone or ones will take its place. And, Blake, I laughed out loud at your opinion comment. Brilliant! "It's a good day for acidity." I've been thinking the same thing. If acidity becomes more important, that will shift power from up valley Napa towards the bay and coast. The central coast in fact seems better suited overall than the north coast to producing wines with Italian-esque acidity. (Though only a few producers are dabbling successfully with Italian varietals.) Probably the balance of power won't shift that much, but I'm hoping that appreciation is broadened by a fresh perspective. No more 90+ point California Pinot Noirs... that's for sure. Greg: Those who want to be free already are. 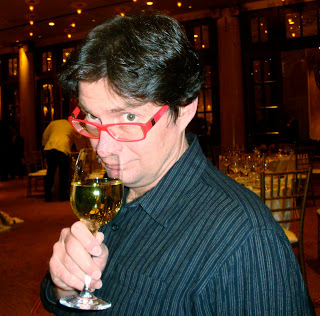 Arthur: Robert Parker is a wine critic and publisher of The Wine Advocate. Cabfranc: That may be the most interesting part of Parker's stepping down. He has been as responsible as anyone for mantaining Napa's supremacy. What happens if, say, Santa Barbara County wines start getting the highest scores in the Wine Advocate? PCP: Not likely. But everyone will have to wait at least a year to see who the winners and losers are. No. He is an aging lawyer whom people paid too much money and too much attention for validating their misinformed beliefs about wine. Careful there, Leo McCloskey. Robert Parker didn't build his "quality model" on "the great wine ratings of Europe," but on the traditional hierarchy of the Rhone Valley and Bordeaux, for better or worse. Now he's recognizing that it's time to go back to the future. Secondly, the slide in prices for Napa Valley cabernet sauvignon hasn't so much to do with "commoditization" of the brand as consumer realization that just because the dog can bark doesn't necessarily mean it has something to say, as Frank Prial put it so memorably more than two decades ago. On the other hand, your point that Robert Parker has helped fight "commoditization" is something to keep well in mind when the ballot is drawn up for next year's slate of candidates for the Vinters Hall of Fame. I'd love to see a follow up on Galloni's role as wine taster supreme, tentatively entitled, "No one palate should have all that power." More than any other wine, the price of Lafite 1982 was a test of both the market and the Parker brand. If the price had declined after he recalibrated his score, it would have reinforced his position as probably the most influential critic ever—the man that didn’t just call the market but made it. Even Warren Buffett cannot do that. But it continued to increase in price, which was surely indicative of Parker’s influence waning. Despite notably poor ratings from Parker, the 2002 vintages of the First Growths have, according to Liv-ex, increased in value by more than 800% since their release in 2003. Relatively low Parker scores have not at all affected the insatiable demand for Carruades. Parker is still hugely influential, though he is obviously slowing down and reducing his workload. Will there be somebody to take his place? I think not. The zeitgeist is for the power of vox populi—that is, blogs and forums—and the brand. The influence of all professional wine journalism is gradually being eroded! Very thoughtful analysis! I don't know that any of the pubs you mention will make an effort to Parkerize their California ratings – I'm dead certain that my friend Steve Heimoff would blanche at the thought. But palates among the cognescenti are getting younger and more acid-friendly, and the Advocate is wise to recognize it. I hope it drifts up to the reviews of WA and OR also. As for Antonio Galloni - good luck. If he thinks he can do Italy, Burgundy, Champagne and California with any thoroughness for more than a year or two, he'd better have the constitution of Keith Richards. Semi-retiring? is that like Semi-interesting? Parker brought to CA Wineries another voice, besides the Wine Spectator.Coincidentally burgeoning wine interest fueled consumer interest in both perspectives. This change will surely bring score changes and shuffle the perceived "Grand Cru" deck of California Wineries. So be it. Maybe in the contrasting flavor preferences someone will jump on expressing the value of "STYLE" within the context of varietals (In CA) and promote to Style differences, not score differences. Using a food analogy good steak is good steak well done or rare....their in is the "style"..drink more of the style you like, and understand how the style differs makes a consumer a happy wine fellow. Should restaurants charge for tap water? Is pairing wine with each course necessary? What is a 90-point wine?